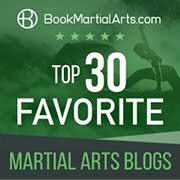 The title of this post is, of course, a misnomer: there are many martial arts that preserve the deflections that I call "haiwan nagashi uke" and "ashibo kake uke". There are even more martial artists who use them unconsciously or unknowingly. However in traditional karate these are techniques that appear to be disappearing - at least in the kata. That they should do so is sad, because they are genuinely effective deflections; one might even say that they are essential elements of a civilian defence arsenal. What is the haiwan nagashi uke? As I discussed in my previous post "Blending blocks", haiwan nagashi uke is a rising block where the body is turned so that the deflection is carried past the head. It is unique in basic techniques because it is invariably accompanied by a "simultaneous" movement with the other hand; either a strike or another (usually low) block. (1) It allows for both a rising and sideways deflection. Two angles of deflection provide a greater safety margin than one. (2) It avoids the issues that accompany the raising of the shoulder girdle in the basic rising block or age uke. I emphasise "basic" in relation to age uke because I am comparing formal techniques one practises repetitively or in certain kata. When age uke is applied in combat the result is quite different, as I will elaborate below. There is also the small matter of whether it is even possible to apply a haiwan nagashi uke; not every situation permits a "simultaneous" technique of this kind. 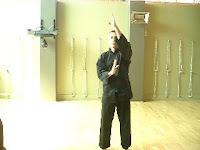 Martial artists (in particular those who practise taijiquan) will often cite the weaknesses of raising the shoulder girdle, including the opening that it leaves for strikes to vulnerable regions or the fact that it leaves you subject to being thrown with techniques such as the shomen nage (see the video below). As a result, some practitioners of taijiquan will doggedly avoid raising their shoulder girdle with any rising block, even when their body has turned. In effect, for any rising deflection they rely exclusively on the "steeple block" - ie. 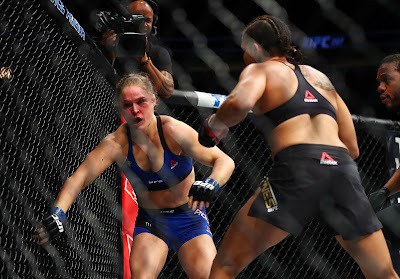 where your forearm is raised at a sharp angle to deflect an attack without raising the shoulder girdle. I am strongly of the view that this is unnecessary (and sometimes unnatural) to take such a strict view. Haiwan nagashi uke avoids the "shoulder girdle" issue because it uses the steeple block at the point of interception. By the time your shoulder girdle is raised your body has turned sufficiently to avoid creating a "weakness" or other opening. In other words, haiwan nagashi uke is actually a sequence of movements blending the steeple block with the basic rising block in the context of a body turn. Consider also that I have yet to apply an age uke without turning my body to some extent (using taisabaki or tenshin - body evasion). Examined in this context, every single effective application of an age uke is actually a steeple block or a haiwan nagashi uke - depending on how you look at it. The basic age uke is just that; a basic movement that acts as a precursor to the full application. I wouldn't dream of abandoning it in favour of the formal technique I call haiwan nagashi uke since the latter is a compound movement. One needs to understand and groove the constituent elements before one can combine them. You will note from my previous post that haiwan nagashi uke occurs in goju ryu kata such as seiyunchin where it appears together with a low block/strike with the heel of the palm (as demonstrated by Morio Higaonna in the adjacent picture). 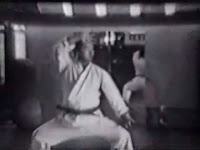 Funakoshi Gichin performing the kata he called "tekki shodan". Note his use of haiwan nagashi uke at 0:15 and 0:31. An early '70s performance of tekki shodan - again, note the use of haiwan nagashi uke at about 0:13 and 0:25. Even in shotokan schools the use of haiwan nagashi uke in tekki shodan is becoming quite rare. 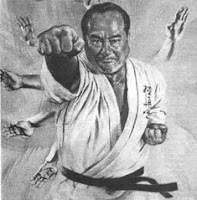 It is quite common nowadays for practitioners of Okinawa-based shorin ryu schools to scoff at the Funakoshi's shotokan as a "modified", "Japanized" (as opposed to the "original" Okinawan version) and hence "diluted" form of karate. As a result, other versions of naifunchin are preferred, notably those of Itosu Yasutsune's other students, namely Kentsu Yabu, Chomo Hanashiro, Moden Yabiku, Kanken Toyama, Chotoku Kyan, Shinpan Shiroma, Anbun Tokuda, Kenwa Mabuni and Choshin Chibana. To my knowledge, none of the schools founded by these karateka practise the haiwan nagashi uke in naifunchin. Could it be that Funakoshi was the only one who had it "right" in this respect? He was, after all, a student of Itosu just as the others mentioned above. And not everything he did would have been modified or "wrong"... 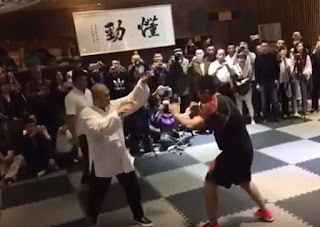 Indeed, it is my view that Funakoshi's tekki shodan kata preserves some elements of the original Chinese chuan fa form that have otherwise been lost in shorin ryu karate. One of these is the haiwan nagashi uke. 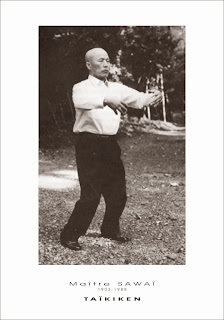 Consider, for example, the image that appears on Funakoshi's book "Karate-do Kyohan", featuring a statue of a chuan fa practitioner clearly demonstrating a haiwan nagashi uke. Where in shorin ryu does this movement survive? I believe that, among other places,2 Funakoshi preserved it in his tekki shodan. Could it be that it was "missed" by the others in their versions of naifunchin and then reinterpreted (usually as standard chudan uke or chest-level block)? Another "forgotten" technique that I believe is preserved in Funakoshi's tekki shodan is the ashibo kake uke (hooking shin block) performed when you step across - a very effective deflection using your shin in an outward crescent motion (see the video below). You will note from the video of Funakoshi's performance of tekki shodan that this deflection is clearly in evidence. 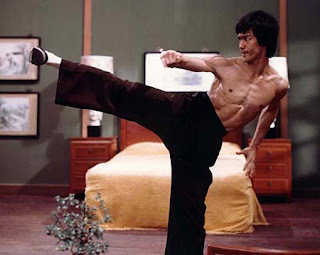 In the '70s performance the technique has morphed into a full crescent kick (a gyaku mikazuki geri). 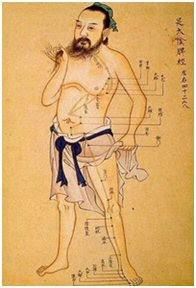 I am told that this was an innovation of Funakoshi Gichin's son, Yoshitaka. In our school we retain the crescent kick, much to the amusement of some (see the Youtube comments on the video below). Why do we retain the crescent kick? It adds without subtracting; the same basic motion of the ashibo kake uke remains, but there is an added technique of the crescent kick which can be quite useful - even if it is just for conditioning. In other words, we see no reason to remove it. That said, I will frequently allow older students to practise the form with just the ashibo kake uke (the crescent kick does require a youthful flexibility and strength). In my view it is sad that so many variants on naifunchin/naihanchi today simply feature a "dead" step which has no specific application in itself other than to get you into position. To the extent that some applications of this move in the kata do not require a crescent motion of the knee3, you lose nothing by adding a technique in the kata. However, if you leave it out, you might lose knowledge forever. 1. I have seen footage of Mas Oyama performing naifunchin (he called it "naifanchin") with the haiwan nagashi uke clearly in evidence. The video was on Youtube but has since been removed. The opening move of the kata pinan shodan or heian nidan which features a haiwan nagashi uke. Another candidate for a "changed" haiwan nagashi uke is the move in the kata Jion illustrated in the picture below. I have long suspected that it was originally performed in the manner of the statue shown on the cover of Funakoshi's Karate-do Kyohan (a movement seen in many Shaolin forms). A technique from the kata Jion. 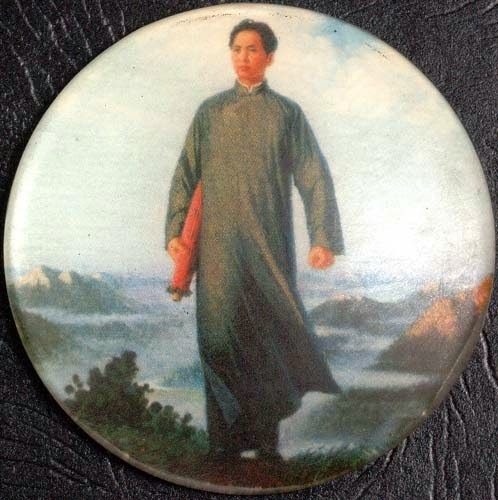 Could an earlier version have featured a haiwan nagashi of the kind seen on the cover of Funakoshi's Karate-do Kyohan? 3. 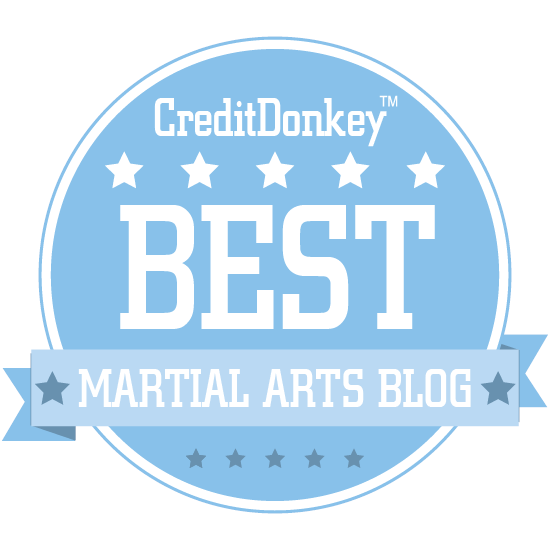 Consider the throw I call "ura irimi nage" which I demonstrate below against a grab at 0:46. The technique does not feature a crescent-like motion of your knee when you step, however whether you have such a motion in the kata or not is irrelevant to the application. Note that I subsequently demonstrate the ashibo kake uke at 0:51. A (somewhat stilted!) demonstration of naifunchin and its applications that I performed at a festival in 1996. Interesting post! I'm afraid that, despite the video and my limited googling, I don't quite understand what you mean by "raising the shoulder girdle". Perhaps you wouldn't mind explaining it in person when we next meet? 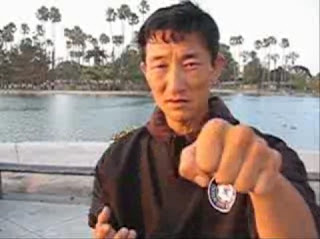 Martial artists (in particular those who practise taijiquan) will often cite the weaknesses of raising the shoulder girdle, including the opening that it leaves for strikes to vulnerable regions or the fact that it leaves you subject to being thrown with techniques such as the shomen nage (see the video below). "Shomen nage" is hyperlinked but the video no longer seems to exist. I've fixed that hyperlink, thanks Xin. As to "raising the shoulder girdle", this is when you raise your shoulder joint. By way of illustration, raise your arm in front of you in an age/jodan uke way and take careful note when your shoulder starts to pop up (unavoidably) as you pass a certain point.